When we think of speed events in athletics we think of 100m – for training and tests we even think of the 40- or 20-yard dash…the furthest a squash player would ever run for a single stroke would be the 1665mm diagonal (about 12 yards) if their nose was touching a back corner and then they went and touch their nose to the opposite front corner:) But in reality, since the overwhelming majority of movements to to the ball for advanced players start from the T, that maximum distance is halved to about 6 yards, less the rebound of the average drop (three feet to second bounce on floor), yielding about 5 yards (or metres) or 15′ as the furthest a squash player has to move. Keep in mind that deceleration in order to be relatively stable as the ball is struck needs to occur at about the halfway point if there is any chance of recovering to the T and resuming the rally. In conclusion, squash players need to train for 2-3m sprints, which is why I do not like to use the word “speed”, but rather explosiveness or power (speed-strength being the more common European Term), as it really is just a split-step, and one to two powerful steps that is required to be trained. The training movements should be as squash-specific as possible as research has showed that strength, power and speed development occurs at specific muscle joint angles and speeds. Here is the annual periodized physical conditioning sequence to become a “faster” squash player. Anatomical adaptation (General Preparation Phase): 2 weeks of strength endurance at 12-15 reps (always assuming three workouts a week and use of a load resulting in failure at the last couple of reps). Strength- Endurance (General Preparation Phase): 4-6 weeks of 10-12 reps. Maximum strength (Specific Preparation Phase): 4-6 weeks of 5-8 reps for post-pubescent and “not injured easily” athletes with 3-4 ears of strength training experience – otherwise just skip over this step. Similarly, if you have been strength training for years and do not lose a lot of strength in transition phases it may not be worth your while to go through this phase. Speed-strength/explosiveness/power (Specific or Pre-Competitive Phase depending on context): 4-6 weeks of plyometrics and short bursts of court movement. Energy for this quality is provided by the anaerobic alactic (ATP_CP or Phosphagen) system which is most powerful in the 0-10 second range and by the lactic system when repeated bursts are required with a single rally or series of 2-3 rallies – after 45-60 seconds of these bursts within 2-3 minutes of play, a player will be forced to reduce their efforts due to accumulating lactic acid in the bloodstream and muscles (see blog post on “How to Lob” effectively:). Most programs recommend about three sets of five reps of 5-10 seconds of work (followed by 6 times that amount of rest in between reps) as a good volume for supplementary speed training – obviously a lot of “training” occurs during matches and practices. Maintenance (Competitive Phase): Most “speed” gains will occur within 4-6 weeks of speed-strength training, at which point most players enter a phase of competitions with league and tournament play and have a reduced amount of time for supplementary training outside of on court practice. Improvements can be maintained with 1-2 supplementary sessions a week at the same volume and intensity of the last week of training. I really like the EXOS approach to training movement, especially in the first few weeks of a program, with the last few weeks being conducted on court “live” (with realistic situations and feeds): http://www.coreperformance.com/multidirectional-movement/. This is a great bank of exercises to inject some variety into your program. Tim Bacon, M.A., CSCS is the world’s leading expert on racquet sport science and coaching development having taught all areas of sport science as both a Lecturer at Smith College and as a Coach Developer for the Coaching Association of Canada while actively coaching (Squash Canada Level 4 Coach) and sport psychology consulting (25+ World Champions). He is a Charter Member of the Association of Applied Sport Psychology and currently runs his consulting practice out of Northampton, MA and maintains his active coaching as the Assistant Squash Coach at Wesleyan University during the CSA squash season (Nov. 1 – Mar. 1). College Squash Players: It’s June 1! Go! February 15, 2018 seems a long way off – but your performance in the CSA national Championships will be largely determined by what you do starting today. Most squash players – especially juniors and college players do not appreciate the long term nature (months not weeks or days) of optimal improvement of athletic performance. 2 weeks before our desired peak (so Feb. 1) we to cut our practice and playing volume in half – so 60-90 minutes of practice a day instead of 12–180 – this will allow a ‘supercompensation” and physical and mental peak to occur on the court. it takes at least minimum of 2 months of intense competition without significant technical (strokes & shots) or tactical (overall game plan/style of play) changes for match performance to become automatic – a prerequisite of peaking – so all changes need to be completed by December 1, 2017. this more or less coincides with exams and winter break by college squash players. related to the above, in order to have a high level of tactics and match play, the volume of physical and technical training must drop to a maintenance level – so only 1-2 sessions a week in December, January and February to allow for an increase in volume of match play and training (five sessions of conditioned games or match play per week – each session lasting the expected duration of matches at Nationals – so 60 to 90 minutes). it takes at least 4-6 weeks to optimally develop sport-specific power, speed and agility related athletic qualities though training three sessions a week – so this type of training must start by November 1, 2017 at the latest. This is the date at which many college athletes (e.g., NESCAC) have access to on-court training with their coach. Note that to accomplish the above, strength training sessions are limited to 1-2 times per week for about 30 minutes once the season starts. this means that the foundation for high intensity squash play and training must be completed by the college player in the June 1 to November 1 period – five months, which seems like a long time until you take a close look at the time period required to develop the physical qualities required for squash, while staying injury free. Aerobic Interval training (preferably a mix of on-court squash specific movement and bike intervals (to reduce stress on the joints – knees/back) three times a week, the last week featuring work periods of 15-30 seconds at 85% effort with about 10 seconds rest between intervals, for a total of about 20 minutes high intensity work. For returning players with a considerable strength training background (preferably under supervision) this is the time to work maximum strength (high loads/fewer reps). Injury prone and less experienced athletes should continue to work strength-endurance (medium loads/higher reps). Enough general power/speed/agility (e.g., low bounce plyos) should be done about twice a week to prepare the joints for more squash-specific explosive loads. Continuous aerobic training can be done 3-4 times a week (20 to 30 minutes) at different training zones from 60-85% to induce the necessary physiological adaptations to lay the foundation for the aerobic interval training to follow. Squash-specific, strength-endurance training (12-15 reps. with medium resistance) can be done three times a week. Upon arriving on campus, return to on-court squash play should be progressive in terms of number and length of sessions per week to avoid a pre-season injury (e.g., 2-3 sessions of 30-45 minutes in week 1; 3-4 sessions of 45 – 60 minutes in week 4.). The priority in this period is to do general types of training for 5-10 hours a week, with an emphasis on prehabilitation and movement preparation for strength training (using a strength-endurance approach in the 12-15 rep range) to improve any physically weak areas and ensure full recovery from any prior injuries. So three aerobic and three strength sessions a week of about 60-90 minutes. This training does not have to be squash-specific, so soccer, yoga, Pilates, cycling, basketball, etc. all work. most students work, so activities will often be determined by location and work situation. This is also the time, before the return to campus to correct and improve any basic squash technical areas: grips, wrist, strokes, etc. This is the major flaw in the U.S. sporting system – squash coaches are not allowed to do this type of coaching outside of the NCAA designated seasons – players are left on their own, and the private squash lessons that are required to make these technical changes can be costly. Most college squash players wait until the official start of the season to start physical training in a systematic way – they do not realize that most physical training must be accomplished before Nov. 1 – and that coach-run squash practices are for on-court conditioned games, drills, and match play – not for physical training, except for 1-2 30 minute maintenance sessions per week. 4:50-5:05 Basic squash drills or play to allow players to “warm-up” motor skill system. That leaves the 5:05 to 6:15 period – so 70 minutes – actually only 60 minutes once you take out time for demonstrations, explanations (even if they are extremely short), transitions between games/drills, and water breaks. Cognitive-motor learning research indicates that 20-minutes is an ideal amount for time (law of diminishing returns) for a conditioned game or drill – which means an ideal practice should feature only three themes – and with only four to five weeks before December exams and winter break – these should be tactical and game situations themes with very little time for technical instruction (as it slows down match-like training). Most CSA Head Coaches now coach both the women’s and men’s team with an minimum squad size of 12 for both men and women; the implication being 60/12 means only 5 min. per player for the coach to observe, encourage, correct, interact during the on-court part of practice. 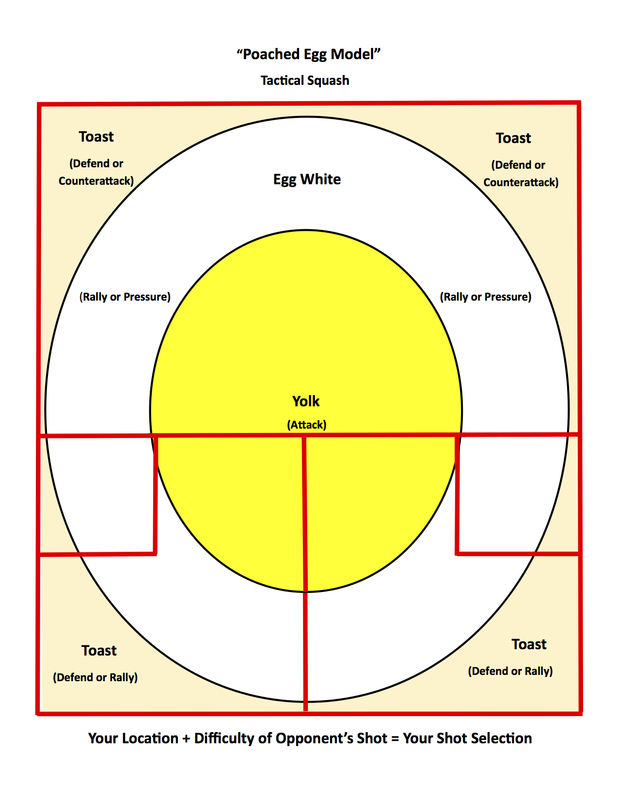 This means a very high priority on the coach using “task teaching” (the “rules” of the conditioned game or drill) as their primary pedagogical tool to improve their athletes’ play. College & High School Squash Periodization: The Transition Phase starts now! Do a thorough evaluation of your players technical, tactical, physical and mental performance at the end of the season – preferably during key matches and final practices leading up to the final competition of the year. A comprehensive technical-tactical analysis of your players is perhaps the most important thing you can do, as this evaluation will form the foundation of their goal-setting for the next season. This is best done by analyzing match video using a good game analysis software such as FocusX2i for iPad and a logical tactical framework such as the Zone or Egg Model that I use for my analyses. If you have not done this before, I offer a consulting service where you can send me your player’s video file and I will do the analysis for you – including improvement recommendations and player goals based on the statistics from the analysis. Alternatively I can train coaches in the use of the software and show you or your assistants how to do your own analysis. An analysis of your player’s mental performance can be done by examining their post-match evaluation forms (if you have used them) for the last few crucial matches of the season, or via paper and pencil tests such as the TOPS (I can provide questionnaires and scoring instructions). An evaluation of your players’ fitness can be done by using their last few fitness test results (ideally one test for each of the three energy systems) and also by simply asking the players to assess each of the physical qualities essential for squash. The other way is simply to note their performance level during the last few workouts of the season (before the peaking or unloading phase). Have your players take 4-6 weeks where they do not play squash, but instead do fun and cross-training activities (ultimate frisbee, swimming, etc.) about three times a week, that allow them to maintain their aerobic fitness and slow down the loss of speed and strength gains. This is the period where they should try and rehab any injuries acquired during the season. There should be limited, formal strength training sessions – and if there are any they should be of lower intensity (think strength-endurance: lighter weights 12-15 reps) and feature a high proportion of complementary exercises. For example the types of exercises found in Exos’ prehabilitation and movement preparation. One to two sessions a week should be sufficient to serious significant detraining. Especially in the two weeks following the major competition, 15-20 minutes on an exercise bike followed by foam rolling, tennis ball myofascial release and use of a stretching rope 3-4 times a week will aid in regeneration. If athletes set their goals for the next season in the week after the major competition, there is no need to do any formal technical, tactical, or mental training during the transition phase – they can just chill and relax. After 4-6 weeks of the above, players can start their preparation for the next season by starting on their Preparatory Period training activities – a topic I will address in the coming weeks. Make sure to plan and schedule a 4-6 week “transition” period following your major squash championship in order to allow your players to fully regenerate for the next season. Do a thorough evaluation, including match video analysis, in order to set effective and meaningful goals with your players at the end of the season. I have addressed the topic of using squash to cross train previously, but it is particularly salient for me this year. I graduated seven players from last year’s Smith College varsity squash team – and I have only four returners, with no new recruits – only 1.5% of high school girls will consider attending a women’s college, despite the many educational advantages of doing so. If I can get somewhat athletic women to come out for the team, I am quite good at developing them to a college standard quite quickly – although it is becoming more difficult with the huge emphasis here ins the U.S. on using squash as a vehicle to gain entry to a top Liberal Arts College (Smith College is amongst the top 15-20 in the country). In 1998 and 1999, my Smith team finished 11th in the CSA rankings – only one person on the team had played high school squash (her JV team) – everyone else started from scratch here at Smith. Our players have also won the Ann Wetzel Award more than any other team. Hope your fall seasons went well! I have four returners ad no recruits coming in this season so we have a few spots to fill on the squash team. I am writing in case you have any suitable candidates. You may or may not know that the VO2 max (measure of aerobic power) of elite female squash players exceeds that of elite female marathoners (65ml/O2/kg/min.) as well as all team sports (FH, LAX, B-ball, etc.) – in other words it is a great aerobic conditioner. One season, two rowers from Karen’s Varsity 8 pulled an erg score at their first spring practice that was identical to their last fall erg score – without erging once from November 1 to March 1 – i.e., maintained their aerobic solely through squash. In addition to the aerobic aspect there are approximately 1,000 powerful hitting or swinging actions per squash match – a statistic which you can compare to the number of “hits/player” for your own sport, about 100 explosive starts, and about 100 full lunges. A match takes about 35-45 minutes to play. Finally, there are many tactical, perceptual, and mental aspects from squash that transfer over to other sports: covering space, chasing down a ball, dealing with the pressure of maintaining a lead or coming back, competing while in a fatigued state, etc., and I run the same mental training program I used to produce 30+ world champions (and one Olympic Gold) when I was doing sport psychology consulting with Canadian National Teams back in the 1980’s and 1990’s. -someone who needs supervision and instruction in mental skills training and modern physical training. -someone who needs to burn about 1,000 KCal at practice to help with weight management. The way we work things is that we give people a two-week trial to see if they like the sport and team. We would also be willing to negotiate a 3 practices/week for varsity (not others) athletes as we acknowledge that 3 straight seasons can be draining. So if you have someone in mind just get them to contact me. Finally, members of or team run rec play on Thursday evenings from 7-9 if any of your players are intrested in learning how to play. “Science of Coaching Squash” E-Book is published! 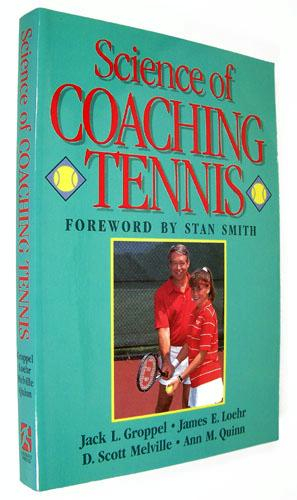 The title for this blog came from a 1989 book published by Human Kinetics: The Science of Coaching Tennis. The mental training section of the book was excellent – written by Jim Loehr, so practical. The other sections were not bad, but the book lacked an overall unifying framework – for example periodization, to really assist coaches in implementing the information. Here is a link to some of the other tennis books I think are worth a read. Chapter 2: Establishing a Positive Learning Environment – Part 1: Understanding Squash Motivation. Chapter 3: Establishing a Positive Learning & Training Environment – Part 2: Leadership for Squash Coaches. Modern Squash Coaching – What does it involve? Notwithstanding the fact that I have a lot of respect for my peer coaches, only a few coaches have advanced degrees in sport science. My assistant coach Erin Robson at Smith College is one of them – former Head Squash and Tennis Coach at Williams College, she competed her M.Sc. in Coaching here at Smith College in our Graduate program – designed to prepare coaches of college teams. Pam Saunders, Associate Head coach at Yale University is another graduate of our program. An equally small number of coaches have completed the other path that combines squash and sport science – a Level 4 Squash Coaching Certification. Aside from myself, Harvard’s Mike Way is the only other active coach in the U.S.A. (we did out Squash Canada Level 3 together back in Toronto in 1980). ESS 520 Leadership for Sport Coaches (graduate program). 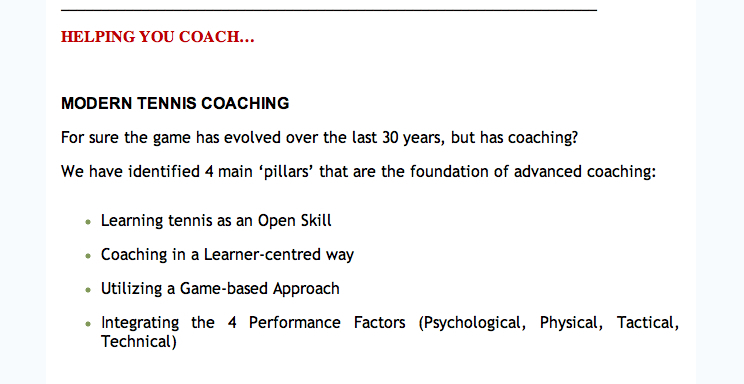 One of my favorite coaching websites is actually a tennis coaching website – Wayne Elderton’s AceCoach. I subscribe to his site (and you should to) and today received his February newsletter in my email which contained the article ” Modern Tennis Coaching”. The short article nicely summarizes my approach to squash coaching – the similarity is not surprising as we have both been trained in the Canadian Sport System’s Theory and Tennis Certification Program. If you are interested in learning more about how these four pillars apply to squash – just use the “search” function on this site!